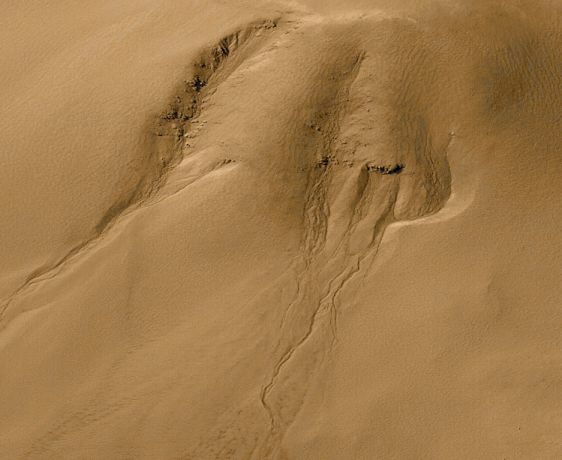 Explanation: The recently revealed gullies on Mars are rare. But they may prove to be sites of present day, near surface, liquid water, holding out the tantalizing possibility of martian life. Too small to have been seen by past Mars orbiters, these disconcerting landforms were found in only about 250 out of more than 20,000 high resolution images from the operating Mars Global Surveyor spacecraft. 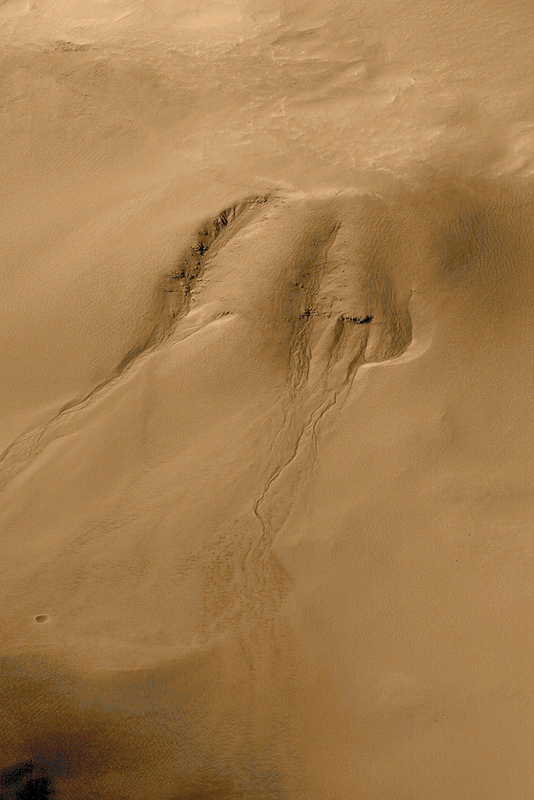 Gullies found so far are located away from the martian equatorial region at middle and high latitudes (predominately in the south) and on poleward facing slopes. They are disconcerting because researchers have a compelling body of evidence that the martian gullies are related to groundwater seepage and, like their terrestrial counterparts, liquid water runoff -- on a planet whose surface is thought to be too cold and atmosphere too thin for liquid water to exist. The gullies in the three kilometer wide area pictured above are in the south facing wall of a crater in southern Noachis Terra. Unblemished by craters and overlaying young surface features, these and other gullies are inescapably young themselves. In fact, future monitoring of the martian gullies for changes could demonstrate whether the flows that formed them are still active today.